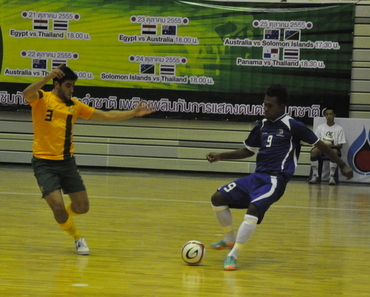 Kurukuru came from behind to lead the first half by 3-2 but Australia regrouped strongly in the second half to win by 10-3. Signs of fatigue were evident on the Kurukuru players as they let Australia take control of the game in the second half after playing superbly in the first half. Australia drew first blood in the third minute with Jarroo Basger providing the goods after finding himself unmarked at the far post. That goal was cancelled out, however, by Mathias Saru who finished excellently following a counterattack. Samuel Osifelo then put Kurukuru in front utilising a corner kick set-piece which he hammered home much to the pleasure of the spectators. In the 12th minute the scores were once again level when Daniel Forgaty stole home a goal after the Kurukuru failed to clear away inside their D. However, that was Forgaty’s only contribution to the game as he was given his marching orders soon after by referee Maiket Yuttakon for a second bookable offence. With 2 minutes left before halftime Kurukuru captain Elliot Ragomo made it 3-2 when he led a counterattack and chipped the ball over the advancing Australian goalkeeper. After the halftime break the Kurukuru’s performance slowed down as travel fatigue set in and the Australians capitalised to score 8 times for a comfortable victory. Lachlan Wright led the way in the 24th minute with a long range shot and Basger got his second in the 27th minute. Nathan Niski also got in on the action and Aaron Cimitile got 2 but Danny Ngaluafe dealt the heaviest blow for Kurukuru with his hat trick. Despite the one-sidedness of the score line the Kurukuru played impressively but simply could not find the juice to continue their rhythm from the first half when they revealed their full potential. Tired after a 15 hour journey from Spain coupled with their first match against hosts Thailand less than a day after arriving, the side was a shadow of itself in the first half. However, a lot of positives can be salvaged by the Kurukuru from the game. Their lead in the first half represented the maxima of the team where they moved with fluidity and strung together passes well. The Kurukuru will now concentrate on training for their first match in the world cup on November 3.